← What marvelous thing might I create today? OMG Pam. My favorite number is 22 and so was my cousin’s who passed (Pamela Sue). My literary agent’s fav number…also 22. 2’s have something special! That’s so funny. I also found out that William Burroughs, the famous beat poet who wrote Naked Lunch and lived here in Lawrence, had a thing about the number 23. He saw it everywhere. Well, I don’t know if this counts – and I already have your book – but when I opened today’s post I immediately noticed the 222 graphic. That’s my wife’s birthday (Feb. 22). Then I noticed the time you sent the e-mail was 1:26 – my birthday. 22 has fascinated me for at least a year now. I am very aware of my lucky , special number. I remember asking for sone sort of sign and a swan coming to mind. I somehow transferred this image to 2 and then to 22. The fact that 222 is of course similar is amazing. 22 is special to me. At least a year ago I asked for a sign. I got an image of a swan. I remembered this as a 2 and then it somehow changed to a 22. I often glance at the time and it will be something like 10.22 or similar. Mine has always been 1111 (or the time 11:11) & I see it constantly in my day, but I will try the 222. Another fun experiment! This is The Volgswagon Jetta rule I think? 🙂 I absolutely love your book & would love for my best friend (& everyone I know) to read it as well. It’s a lifechanger & so much fun to read!! Thanks. Would you beliveve just I went on to Amazon kindle site to check out the book by Cheryl Strayed, straight after reading Pams post and scrolling down found the following book title! I often see 22 or 222 and have wondered at the significance of the numbers. I was told it meant something was going to happen or things were about to change quickly. My magic number is recurring 1’s. I see them often. Not just on the time but when I pay for things or in certain quantities lol I love it. Love your site. I just laughed out loud (literally, and shook my finger while looking skywards), because reading this post, I had nothing for the number ‘222’, but while pausing and and thinking of the ‘coincidence’ of numbers, I thought of my connection with the number ‘101’. Then, like, ohh, let’s call it call it synchronicity, I read ‘101 Dalmatians’! Perfect! Couldn’t have planned it better myself! Love your posts and your work. I had sort of given up on my own search for ‘222’ occurrences. Then, about 3 minutes ago, it was time to go to sleep, and, in the habit of checking email before I hit the pillow, I thought, “I wonder if anything came in at 2:22 am, thinking it was much later or past that time…until…lo and behold I glanced at the clock and it WAS 2:22 AM. ‘Nuf said. I just discovered your site. Oh goodness I just looked at the clock today and it was 2:22. Every time I see the clock it is 12:34, 1:23, 3:33 etc but I have not seen 2:22 for some time till today. Oh your book is so GOOD E 2. I laugh out loud and can relate so much with so many things you write. The experiments are so much fun and have taught me so much about myself. Thank you, Thank you ! Hi! I’ve had a 22 thing for many years….maybe 20 or so. It started one week when it was impossible not to notice. Like I was on flight 222 that left at 2:22 sated in row 22, getting a car that was in parking slot 22. 22 found me! Not the reverse. Since then I consider the number a weird angel and sign I’m on the right track. I’ll often go through periods where every time I look at the clock it will be some hour :22. Or I’ll be behind four cars in a row with 22 in the license plate. I love the angel-speak! It zaps me into the moment. I have a weird/ funny story about the number 222. It’s almost unbelievable. I was born the 22nd of February, at 2:22 am . For years I wondered about all this, never fully understanding it, LOL. I thought it was just a coincidence, even though I recognized its weirdness. At 22 yo I got married and, for the first time I intentionally chose the 22 nd of July for the marriage. Life went on and I got pregnant of my first child ( I have 2 and I don’t expect to reach 22!). Even though she was born on January 9, the delivery room was…number 222! Two years passed and my second child was born …. the delivery room? 22!! 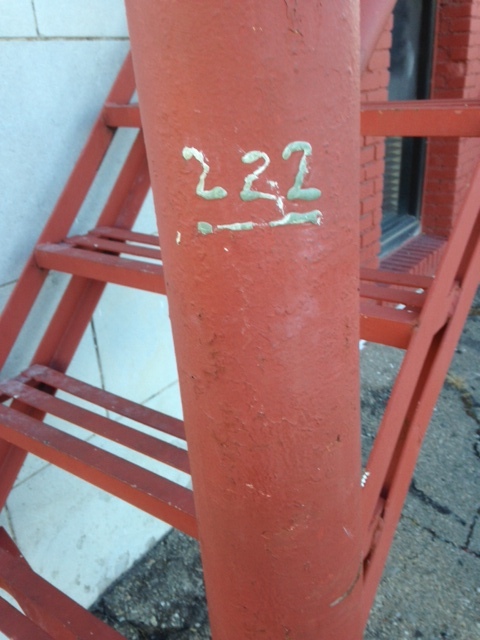 I keep seeing 222 everywhere I go and, these days… I just laugh.